Home » Art » Literary » Artists! Sustain Thyself! Whether a myth or a sign of the times, that thought must enter your mind every time you cross the intersection of 11th and Howard in the Old Market. Portrait painters, gangly guitar pickers and plaintive sax players, engaging magicians and the latest version of the Von Trapp Family aren’t there just for your amusement. Sustainable art and performance for the benefit of society and the environment gets most of the attention today, but for all of the above competing for attention and more, making a living is an even bigger, more immediate issue. The U. S. Census Bureau and the Bureau of Labor Statistics estimates that in 2012 there were well over two million artists working in America. Only 10% of them labeled as fine artists including painters, sculptors and illustrators. The National Endowment for the Arts says of the 200,000 or so fine artists, roughly 35% of them are self-employed, that is, making a living primarily with their art. The BLS estimates another 25% work within art museums and centers or as curators and gallery owners, or in other arts related fields even as they create art. Some 30% have jobs in non-related fields or are supported by their spouses, families or patrons. Despite these sobering statistics, four-year colleges graduate more than 120,00 arts majors annually in all fields according to Strategic National Arts Alumni Projects (SNAAP). Though the NEA reports that full-time fine and studio artists make 15% less than comparably educated professionals in other fields consider this. In a 2011 Economist article, Alex Tabarrok, a George Mason University economist said that in 2009 the U.S. graduated 89,140 in the visual and performing arts alone, more than in computer science, math and chemical engineering combined. And more than double the number who graduated in 1985. Even as their numbers continue to increase, the main goal of each fine and studio arts major is sustainability: how to make a living selling their art. Yet, though their degrees may have shaped their skill and talent, many hopeful and emerging artists soon learn that viability in the market place is another matter often not addressed with their BFA or MFA. Two such resources, at times working together toward similar goals, are the Metro Tech Community College and The Union for Creative Art. MCC offers its Certificate of Achievement in Entrepreneurship for artists and UCA makes available several programs including internships, Support for Artist workshops, fellowships and an exhibition program. MCC’s certificate includes courses specifically designed to prepare artists for a professional career as a studio artist such as Creative Careers, Art Gallery Management, Internship, and Portfolio Development and Professional Practices. In addition to these art courses, the certificate also includes business entrepreneurship courses that help students develop a specific business plan. “This is one of the few programs in the area specifically designed to provide artists with business skills,” said Anne Burton, MCC arts instructor in Creative Careers. “The certificate provides business and marketing skills for artists who are looking for help dealing with the practical issues related to making a living as a creative professional. Burton, a printmaker and painter herself, said that information is key to succeeding as an artist. As an art student she did not understand the context of the art world. Burton helped MCC develop the Professional Practices course which helps one put together a professional looking portfolio. Students learn about practical issues like photographing their artwork, writing an artist statement, creating a website, using social media to market their work and how to submit their work to galleries. And they visit professional artists’ studios and galleries here in Omaha to connect with the reality of life as an artist in the Omaha area. 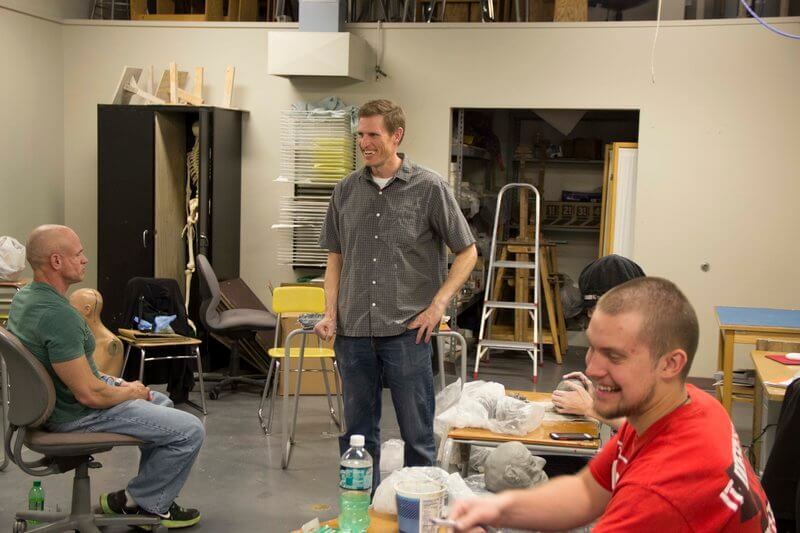 Those interested can also take Art Gallery Management where students participate in all aspects of running the Gallery of Art and Design at MCC on the Elkhorn campus. This includes the entire curatorial process from selecting artists to hanging the work as well as writing press releases and marketing the exhibition. Networking and book keeping. Though his class concentrates on both, he says there are two main obstacles each artist faces in order to be sustainable, and the solution to the first can’t be taught. Abe Jackson is an artist who Burmeister believes has made a successful career after MCC because “he consistently finds way to make and exhibit great art.” A large part of that success is due to Jackson’s determination to incorporate art into both his personal and business life. For him art is less a means of economic sustainability and more a way of feeding something else. A mixed media artist by choice, by trade he is a data analyst who “looks for those opportunities to make (art) a part of my job. Maps, graphs, custom program interfaces, etc. are acceptable visual art forms that make my daily work life creative and appreciated.” He credits MCC for giving him the tools to make this possible. One such venue for professional and artistic growth in these areas is The Union for Creative Art, dedicated to, among other things, serving emerging artist needs not necessarily met by traditional, educational programs in the Metro. Artist sustainability is key to its mission. UCA Program Manager Paige Reitz says that the idea of a “starving artist” stems from the historical tradition of undervaluing artists and their work. “While there are many successful artists and ways to make means meet as a full-time artist, there is still a common struggle among artists that feel like they are not valued, or their work isn’t valued, or that they cannot make a comfortable living off their work,” Reitz said. “Just a small example, of all the Union Fellows we’ve served, only two were full-time artists making a modest living off their art. She realizes that The Union will never fully change how society values and views the role of artists. But she thinks UCA’s Support for Artists workshops that focus on providing professional development, such as building an online portfolio, finding grant resources and preparing taxes, go a long way toward building confidence and how artists value themselves. Besides its workshops and fellowships, UCA collaborates with MCC by accepting its interns who get first-hand experience in networking in the Metro community with the sort of “arts group” that Jackson advised emerging artists seek out. One such intern is student Shelby Bockman, a painter/printmaker, who says she has made the most of her opportunities. The 21-year-old ockman will graduate this fall with her Certificate of Achievement and like many emerging artists she is eager for but wary of what the future holds for her and her art. And what’s more, according to SNAAP, artists are among the happiest professionals, happier than lawyers, financial managers and high school teachers. For many artists, there is very little relationship between satisfaction and the amount of money they earn. It appears that artists of all ages are starving for something more.